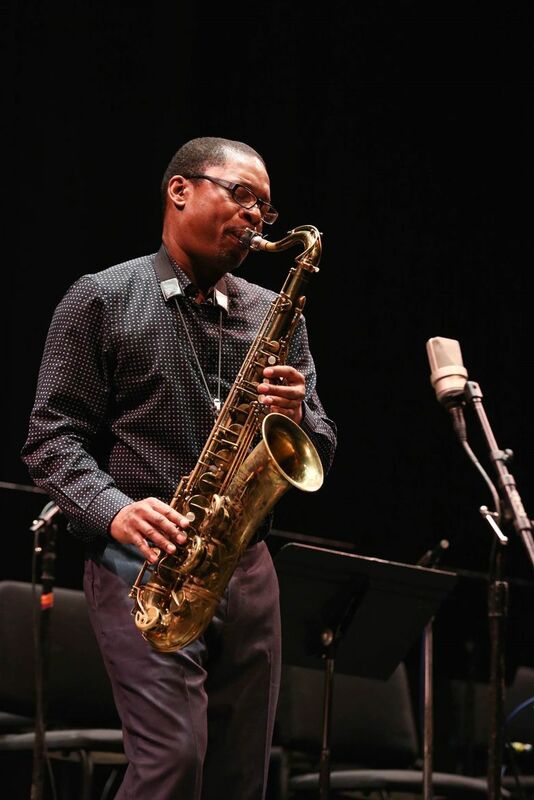 This year’s PDX jazz festival shone a light on the legacy of John Coltrane, featuring old Coltrane collaborators — including Pharoah Sanders and Reggie Workman — and his son Ravi on saxophone. Portland’s 11-day-long PDX Jazz Festival, which concluded Sunday (Feb. 28), has made a specialty of honoring jazz history — Frank Sinatra last year, and John Coltrane this past weekend. The multipronged 2016 nod to what would have been Coltrane’s 90th birthday succeeded on many levels but also prompted some thoughts about the value of historical retrospectives, particularly since the programs that really sparkled were ones that privileged original or spontaneous music. Friday at the Newmark Theatre, John Coltrane’s saxophone-playing son Ravi, with a trio composed of Orrin Evans (piano), Luques Curtis (bass) and Mark Whitfield Jr. (drums) played the five compositions of John Coltrane’s classic 1961 work “Africa/Brass” with an eight-piece, locally drafted wind ensemble under the direction of Portland jazz master Charles Gray. Per its title, the attraction of “Africa/Brass” is its brass instrumentation — two French horns, euphonium and tuba — not to mention the wild, colorful parts written by Coltrane’s sidemen at the time, Eric Dolphy and McCoy Tyner. Sadly, the excitement of those parts felt flat in translation, and there seemed to be little connection between the quartet and the octet, with the exception of the roaring French horns and fluttering flute on the title tune, “Africa.” You somehow got the feeling these musicians might have been happier playing their own music with their own bands, though Whitfield (son of the famous guitarist) crackled with Tony Williams-like precision and joy. Saturday’s tribute to Ravi Coltrane’s mother, Alice Coltrane, had more heart. It featured not only Ravi Coltrane, but historical Coltrane collaborators Pharoah Sanders (saxophone) and Reggie Workman (bass), plus harpist Brandee Younger, who supplied the hypnotic swarms of Alice Coltrane’s meditative music, and even a tamboura player, who offered an Indian drone. Sanders was transcendent on the ballad “Say It (Over and Over Again),” and when Ravi Coltrane explained that “For Turiya” was written “for my mother,” it felt as if we had been invited to a private family service at the Church of Coltrane. The transfixed full house brought the ensemble back for a well-deserved encore. Kudos to PDX for focusing on a female musician in an often male-centric genre. Beyond tributes, the highlight of the weekend was Workman’s concert in the humble environs of Alberta Abbey, a decommissioned Baptist church, with his band RW WORKz: Carlos Homs (piano), Tapan Modak (drums), Ferenc Nemeth (tabla) and guest reedman James Carter. The 78-year-old bassist’s deep, resonant throb — which reached back to Africa (“Shades of Angola”) and through the heart of blues and romance (“Soul Eyes”) — was a keen reminder of what draws people to jazz in the first place. It’s not about technique — though Carter’s dazzling, elbows-out solos on flute and alto and soprano saxophone offered plenty of that — and it’s not even about history or composition or “classics.” It’s about a soulful, spontaneous sound and mood — drenched with pain but also joy — that occurs only in the very special aesthetic space opened up by jazz. That feeling flooded the Abbey — and also the “saxophone summit” Sunday afternoon with tenor players J.D. Allen, Jimmy Greene, Devin Phillips and, briefly, Joe Lovano — but sometimes went missing from the grander concerts.